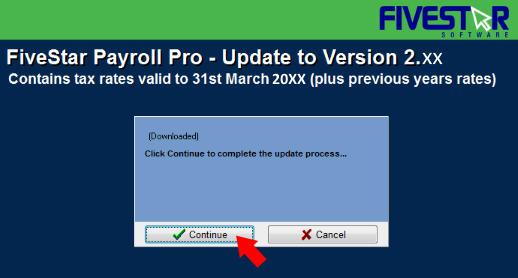 You can quickly update Payroll Pro to the latest version by clicking 'check for updates online'. This is located just below the payroll version number at the top of the Payroll Main Menu. Alternatively you can select 'Help' from the top menu and then click 'Check for Updates Online' in the drop down menu. After selecting this, you should see something like this. Click "Download Now". Just click "Continue" and follow instructions. If you encounter a problem before this, then it is possible Windows might be blocking the update .. please see the next section "Windows Blocking the Updae" for what to do if this happens. 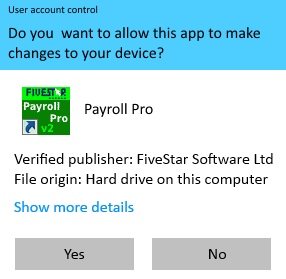 Windows may be blocking the update process, so you could try to run Payroll Pro as an "Administrator" to update. > Exit all programs including Payroll Pro. > Locate "Run as Administrator" and tick this, then click OK.
Just answer Yes (or OK if the button says OK). Now run Payroll Pro again, and try clicking "Check For Updates Online..." again. You can keep the "Run as Administrator" option as above, and should not need to remove the tick for payroll processing. However, Windows Vista and Windows 7 do have a slight problem (Windows not Payroll Pro). See the note "IMPORTANT: With Windows Vista and Windows 7" below. IMPORTANT: With Windows Vista and Windows 7 (and possibly higher versions) - if you have Payroll Pro installed in Program Files, it is possible that Windows will do strange things if you leave the Administrator setting on. 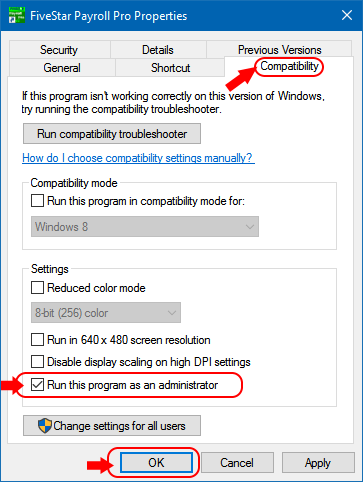 You can turn this off after updating by going through the above procedure and removing the tick next to "Run As Administrator". We do suggest moving Payroll Pro out of Program Files if you have Vista or later, especially if you have problems. 1. Run Payroll Pro, and select "Troubleshooting". 2. When the "Troubleshooting" program appears, click "More..."
3. Click "Payroll Support Information". 4. Click "Copy to Clipboard" and then create a new email to send to us, and paste the information into the email. 5. We can then advise you of the easiest method. 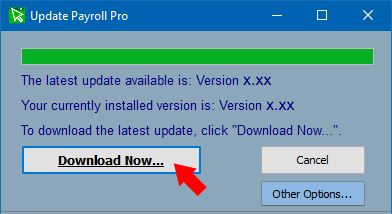 If you click "Check For Updates Online" and then click the "Download Now.." button and either nothing happens after this or you receive an error message, it may be that the update file "ppver2up.exe" has been corrupted somehow and/or Windows is not letting Payroll Pro replace this. > When a " Confirm" box appears, click "Internet"
> You should now see some options. This time select option "2. 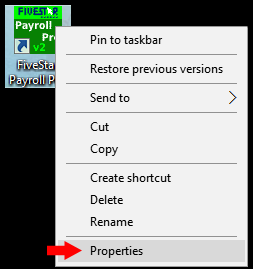 Use Previous Download"
If you were not able to see the options above, you can manually delete the file ppver2up.exe from the Payroll Pro folder. Locate the drive your payroll is installed on. This is usually drive C: and may show as "Local Disk C:". If you cannot see this, then go to "Program Files" and look for the folder name there. Once you have located the folder name, double click it to open it. Now locate the file ppver2up.exe and delete just this file. Exit all programs, then restart your computer. Once the computer has restarted, run Payroll Pro again and try the update again. Download the update file by clicking here: ppver2up.exe and save it into your Payroll Pro folder. If you are unsure where your Payroll Pro is installed you can run Payroll Pro and select HELP then ABOUT. This will show you where Payroll Pro is. Alternatively, you can right click the shortcut on your desktop and select properties. The Start In folder will show you the name of the Payroll Pro folder. After saving the file, run it and it should automatically update Payroll Pro for you. Save the file ppver2up.exe into this new folder. You will be asked where Payroll Pro is installed. Instead of entering the location of Payroll Pro here, enter the name of the temporary folder you just created and saved the file in - eg PayTemp. You will be given a message advising that Payroll Pro is not here and asking if you would like to put the files here anyway - Answer "Yes"
Answer YES to the next confirmation prompt also. When complete a message will advise that Payroll Pro has been updated, but because we are doing something a little different here, the process is not actually complete. Now use "My Computer" (or "Computer") and locate the folder above. Double click to open it. Now select all files - One way to select all files is by using CTRL+A on your keyboard. Next copy these either by pressing CTRL+C on your keyboard, or right click with the mouse and select COPY. Now use "My Computer" (or "Computer") again and locate the Payroll Pro folder and double click to open it. Paste the copied files into the folder. The files can be pasted by right clicking and selecting Paste, or by pressing ALT + E to open the top menu and selecting the "Paste" option. You should be asked if you want to replace the files – answer "Yes To All" so that all the updated files are copied. You should run Payroll Pro and the version number should show the latest version. If you still have problems please email us for a CDROM.